The fragrance is indescribable! It does, however, conjure images of iced sweet tea , enjoyed on the veranda. The gardenias are blooming. Wish I could post the fragrance! I am in a quandary. Do I paint these black (matt) or pale blue? 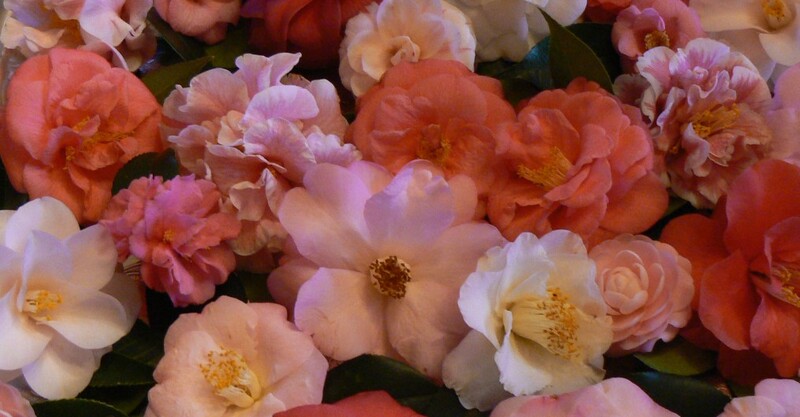 Surrounded by hydrangeas the blue would be whimsical, but what about when the camellias show in pink red & white? Recently, Tara Dillard of A Garden View, posted about frames in the landscape. It brought to mind a lovely vignette I saw in a garden while in England. Initially I thought an artist had set up to paint. The lesson here is that framing a view brings it into relief. Scroll back to the last photo, see the difference? See Tara’s post here. Plants with a cascading habit, call attention to the ground plane. Above, The heavy flowers of Snowflake Hydrangea (Hydrangea quercifolia ‘Snowflake’), draw the eye to the Japanese painted fern (Athyrium nipponicum). The flower on ‘Snowflake’ has double sepals, significantly different from that of ‘Amethyst’ above, or ‘Alice’ below. Hydrangea arborescens ‘Annabelle’ forming it’s flower heads. This is one hydrangea that SHOULD BE PRUNED early spring. These hydrangeas form flower buds on NEW GROWTH. but it prefers the path so I’m going to stop fighting and let the vinca do its thing. Arum foliage has died down & the berries have formed. They need to ripen, then they will be spread where more are needed. See previous post on Arum. The Hydrangea serrata are in bloom. Close up of flowers, H. serrata ‘Kurenai’ above. H. serrata ‘Shichidanka’ below. The grapes will soon obscure my old tool collection. below. Base of Tulip poplar (Liriodendron tulipifera) with a river of Japanese Painted fern (Athyrium nipponicum) & Japanese Hydrangea-vine (Schizophragma hydrangeaoides ‘Moonlight’) Below. Oak Leaf Hydrangeas ( Hydrangea quercifolia) below, in all their glory.